Rwanda’s National Consultative Forum of Political Organizations has called on Rwandan politicians to promote unity of Rwandans at a ceremony to close the mourning week of the 25th commemoration of the 1994’s Rwandan genocide against Tutsi. The mourning week which started on April 7 closed with honoring of politicians killed during the genocide who were buried at the Rebero genocide memorial site, in Kicukiro district, Rwandan capital city Kigali. 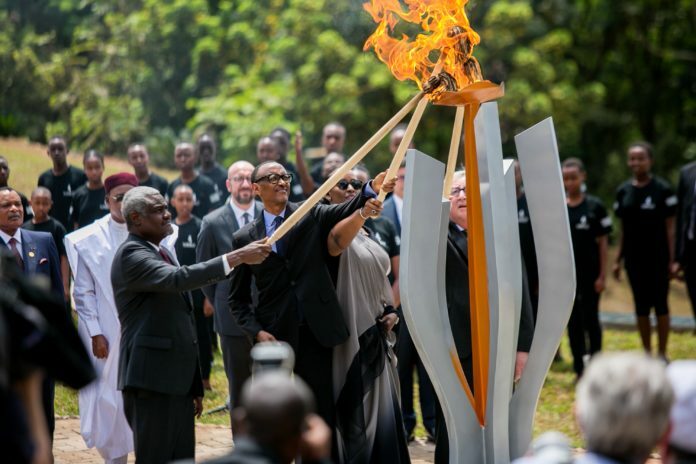 At the ceremony, top Rwandan government officials, members of diplomatic corps and families of fallen politicians led by Rwandan Senate President Bernard Makuza laid wreaths on the graves of politicians at Rebero genocide memorial site. The 25th commemoration gives politicians an opportunity to renew their commitment to build the nation and promote good governance, said Christine Mukabunani, representative of the National Consultative Forum of Political Organizations, said at the event. Makuza commended countries that have enacted laws against genocide denial and appealed to others to emulate. He also urged Rwandans to protect the Rwandan government’s approach of power sharing, participatory governance and consensual politics, which have produced positive results over the last 25 years. Remains of more than 14,000 genocide victims were buried at the Rebero memorial site. Most of them were members of the Liberal Party or Social Democratic Party, who were reformists standing firmly against former president Juvenal Habyarimana’s regime of hate ideology, according to the National Consultative Forum of Political Organizations. Commemorative activities of the 1994’s genocide that claimed the lives of over 1 million people will continue until July 4.